My mom, Liz McAlister, who turned 78 in November, had been arrested deep inside the King’s Bay Naval Base in St. Mary’s, Georgia in the early hours of Wednesday morning. Along with six friends, she carried banners, statements, hammers and blood onto the base. 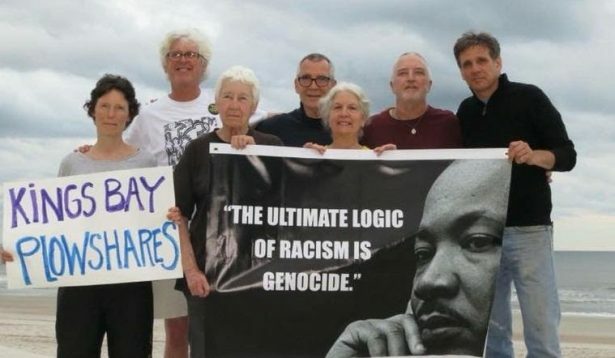 They started their action on April 4: the 50th anniversary of Martin Luther King’s assassination. They walked onto King’s Bay Naval Station just hours after Saheed Vassell was shot and killed in a barrage of bullets by New York City police officers, just hours after hundreds of demonstrators filled the streets of Sacramento for another day, shouting “Stephon Clark, Stephon Clark, Stephon Clark” and demanding accountability after the young father of two was killed by police officers on March 18. These seven white activists know that when you are black in this country, your own corner, your grandmother’s own backyard, is a free-fire zone more dangerous than any military base. My father participated in five of these Plowshares actions in his lifetime and helped organize countless others. Committed conspirers, steeped in active nonviolence, have carried out more than 100 of these actions since 1980. This is my mom’s second action. She and her current co-defendant Clare Grady, were part of the 1983 Griffiss Plowshares in upstate New York. I tried to figure out a way to talk to them that would make sense and, in thinking it through, I realized that none of this should make sense to anyone! Nuclear weapons? Absurd! Police brutality and white supremacy? Senseless! Plowshares actions with their symbolic transformation and ritual mess-making? A foolhardy act of David versus Goliath proportions! “Wait, these nuclear weapons … They are war things?” Seamus asked. Frida Berrigan is a columnist for Waging Nonviolence and the author of “It Runs in the Family: On Being Raised by Radicals and Growing into Rebellious Motherhood.” She lives in New London, Conn. with her husband Patrick and their three children.